Israel is the only state in the Middle East that grants freedom of religion, equal rights under law to women and gays and lesbians, and maintains strong environmental protection laws. Ironically, former soldiers have often led this progressive state as its Prime Minister. Yet, in the tradition of Nixon going to China, it was Menachem Begin and Yitzhak Rabin who negotiated some of the region’s most significant peace treaties. Former Ambassador Yehuda Avner served them both. His history of Israel’s highest political office continues to serve as the roadmap of Richard Trank’s The Prime Ministers: Soldiers and Peacemakers (trailer here), which opens this Friday in New York. Throughout the follow-up to The Prime Ministers: the Pioneers, Trank continues to draw on Avner’s insider knowledge, but he starts with a telling incident that predated the diplomat’s government service. In the so-called Altalena Affair, Rabin-led Haganah-IDF forces and Begin’s Irgun found themselves clashing in a very public and embarrassing manner. However, they would soon settle into political roles as leaders of the majority Labor government and the Likud minority, respectively. As trusted aide to Golda Meir and Levi Eshkol, the British-born Avner’s services were retained by the newly elected Rabin, who was determined to forge stronger ties with the United States, but dealing with Kissinger was a complicated task. Yet, they made headway, including a grand state dinner at the Ford White House, which supplies one of the best anecdotes of the doc duology. The surprise election of Menachem Begin, the first transfer of power in Israel’s history, coupled with the less surprising election of Jimmy Carter ushered in an even trickier era. It was not a good personality match, but Begin was more committed to the peace process than most political commentators realized. Despite the naïve bungling of the Carter Administration (Avner duly provides more than enough examples), Sadat was also ready to deal. While most viewers have seen the familiar Camp David video, the archival footage of Sadat’s earlier visit to Israel really puts the Accords in a whole new context. Indeed, providing fuller, richer historical background and context is exactly the mission of Trank and Moriah Films. You can trust them to give the entire story of Israel’s triumphs, as well as its failures (such as the shelling of the Altalena). There is a great deal of important history in both Prime Ministers that will give students and concerned citizens a better understanding of Israeli and Middle Eastern history. 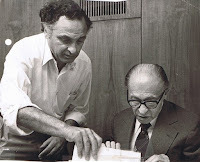 The late Avner was also a wonderfully eloquent and engaging guide through Israel’s momentous Twentieth Century history. He is so lively and forceful in the film, it is hard to believe he is no longer with us. At least he left quite a testament. Like the previous installment, Soldiers and Peacemakers is also unusually well crafted by documentary standards, featuring a classy symphonic score composed by Emmy winner Lee Holdridge and the dramatic narration of Michael Douglas and Christoph Waltz, giving voice to Rabin and Begin, respectively. Watching Soldiers and Peacemakers will help viewers clearly understand where we are now with respects to Israel and the Middle East. Yet, thanks to Avner’s wit and insights, it is never dry or stodgy. 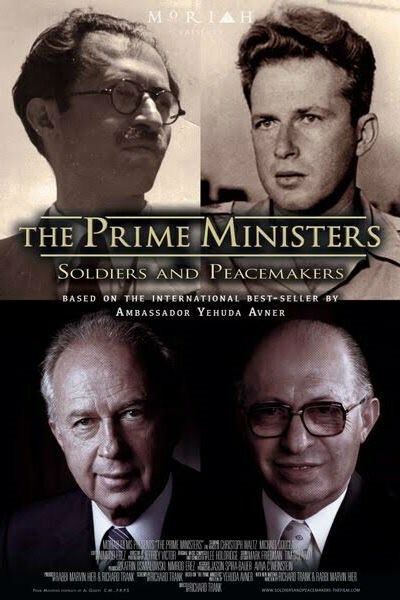 Highly recommended for students and general audiences, The Prime Ministers: Soldiers and Peacemakers opens this Friday (10/9) in New York, at the AMC Village 7.